Even if you have a history of late payments and your credit score isn’t what you’d like, here’s some good news — you can still turn your credit around and get your score above 700. From start to finish, we’ll tell you everything you need to know. At its most basic, your credit score is a 3 digit number that is used to quickly give lenders an idea of how creditworthy you are. Credit scores are calculated by running the information found in your credit report through a specific algorithm. 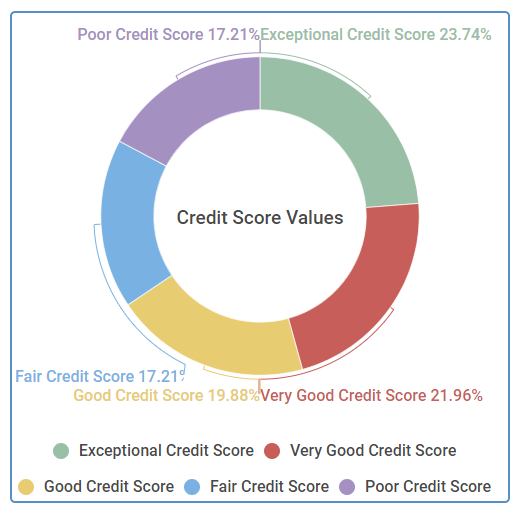 While there are many scoring models out there, the FICO Score is the one that is most widely used and recognized. As you can see from the chart below, FICO scores range from 300 to 850 — anything above 670 is typically considered to be “good,” but aiming for a score of 700 or higher is a sound goal, with 700 being approximately the average score. Description: Your FICO credit score is classified as one of five categories. Each category represents a numerical range within your credit score and is determined by several factors. Source: Fair Isaac Corporation (myFICO.com). Why is it important to have a credit score above 700? A good credit score impacts so much more than, say, your ability to get a new credit card. Instead, it can touch nearly every aspect of your life and can either cost or save you a significant amount of money, depending your score. Lenders will look at your credit score to decide how likely they feel you are to pay your debts back on time. The higher your credit score, the more desirable the offers you receive will be, such as a higher credit limit at a lower interest rate. You will also get better interest rates on loans and have access to more financing options when you need to take out a loan — and a good credit score can sometimes even give you a leg up in qualifying for rental properties. Source: Credit scores were calculated from 5,000 Credit Sesame members on 3/11/18. 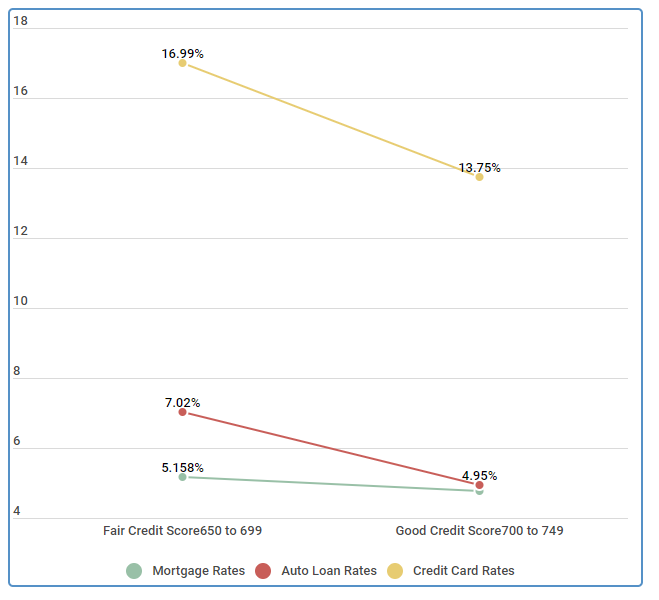 You can see, based on the data above, that raising your credit score from fair to good can make a big difference in the amount of interest you will pay for some of the most common big-ticket items, including your house and your car. Let’s say you’re applying for a 5-year, $35,000 loan to purchase a new car. If you have fair credit, you can expect to pay 7.02% in interest — which translates to a monthly payment of about $693. However, if you can improve your credit to a good score before applying for the loan, you’ll save a significant amount in interest, with a monthly payment of $660. While this doesn’t sound like much of a difference each month, but it adds up to $2,020 over the course of the loan. What factors into your credit score? While it may seem complicated, the best way to improve your credit score is simple — stop doing the things that are causing your score to go down. While there are many different models to calculate your score, there are essentially 5 factors that go into determining your score. Now, let’s take a closer look at each of these individual factors, as well as what they mean. This is the largest single contributor to your score, so it’s important to pay attention to it. Late or missed payments will bring your credit score down, but a longstanding history of making your payments on time will help to increase your score. Aim to pay all of your bills on time, every time. 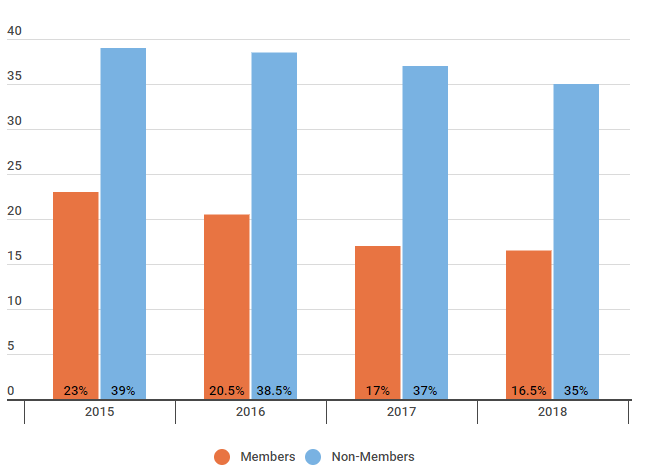 Source: Survey of 2000 members and non-members 5/5/2018. Of those we highlighted those members who believe that making on-time payments was a deciding factor in their credit score increase. 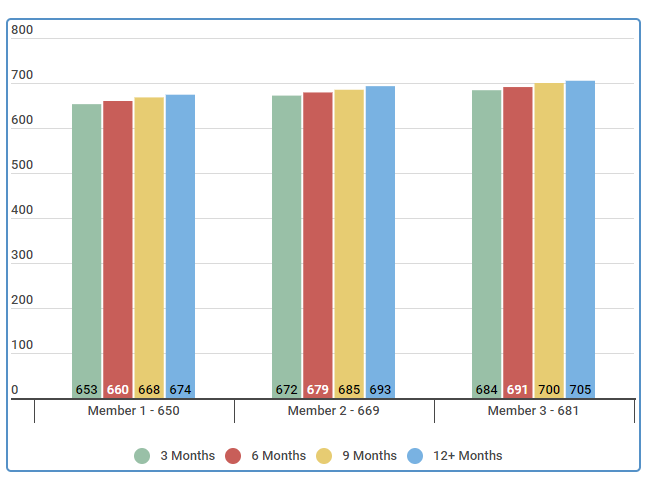 Above, you can see the average improvement to 3 members’ credit scores by making on time payments. In 12 months, this strategy helped them increase their credit score by as much as 41 points. Credit utilization, or your debt ratio, measures the amount of debt you currently have to the sum of your credit limits. Generally speaking, the lower your credit utilization is, the better your score will be. To improve your score, aim to have this number below 30% — but for the best scores, you’ll want to aim for 10 percent or less. Source: Survey of 2000 members and non-members 5/5/2018. Of those we highlighted those members who believe that improving credit utilization was a deciding factor in their credit score increase. 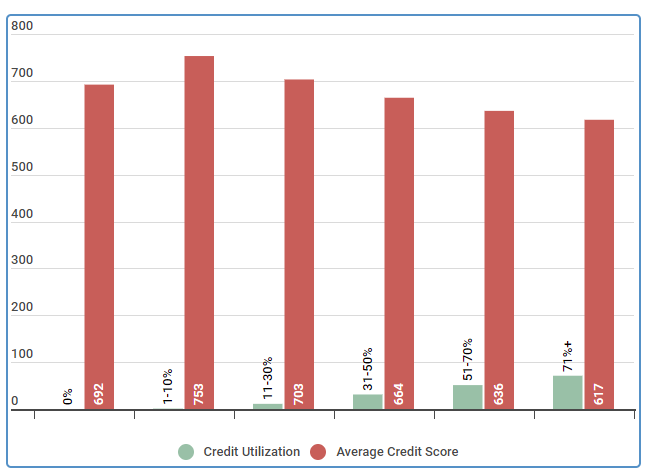 As you can see from the chart above, several Credit Sesame members were able to improve their Credit Scores by focusing on their utilization rates. Member 1, for example, upped their score more than 50 points in a year. Lenders also want to see a long standing and responsible use of credit. Lenders will typically look at the average age of all of your open accounts — and the longer your credit history, the better it is for your score. Make sure to keep your oldest accounts open, even if they don’t have a balance. Source: Credit Sesame surveyed 510 adults from July 14, 2018 to July 20, 2018. 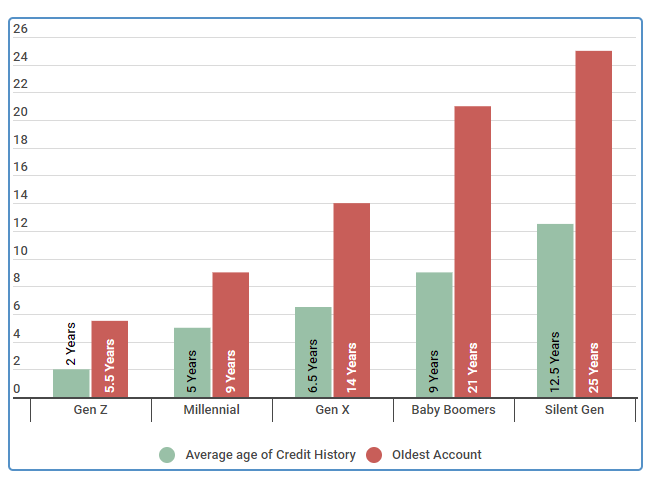 The data above shows a breakdown of the average age of credit and the oldest account age for various generations. This certainly can correlate with age — Gen Z doesn’t have the credit longevity that someone in the Baby Boomer generation has, for example. 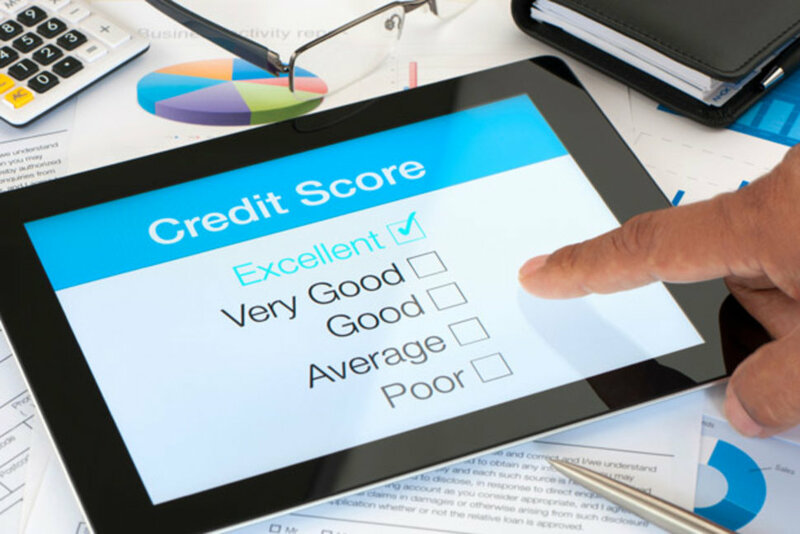 The types of credit that you have can also impact your score. For the best score, aim to have a mix of credit, such as consumer credit cards AND an auto loan. Source: Survey of 2000 members and non-members 5/5/2018 with generalized credit related questions. The data above shows that having a healthy mix of credit types improves your credit score, regardless of the starting point. While checking your credit yourself won’t hurt your score (in fact, it’s encouraged! ), hard inquiries can and will ding your score. Even if it’s just a few points here and there, it can add up. Hard inquiries are the credit checks when you apply for a new line of credit — so do your best to keep these at a minimum. Keep in mind that while FICO Scores range from 300 to 850, there is no single “magic” number that signifies that you have good credit, bad credit, or somewhere in between. Lenders each have their own standards that determine whether you are creditworthy and what type of interest rate and what offers you will qualify for. However, a FICO Score at or above 700 is typically considered to be good, with 740 to 799 being very good, and anything at 800 or above being exceptional. We spoke to Credit Sesame member, Jon, earlier this year to find out how he was able to save thousands by raising his score above 700. Here’s what he had to say. We interviewed Jon on August 10, 2018; he earns $72,000 a year as a executive chef, is 36 years old and resides in Las Vegas, Nev. He lives with his husband of 11 years, and they have no children, but do have three cats. Why did you seek to raise your credit score above 700 originally? For the majority of our married life we had been living in Henderson, which is a great community, but with both my husband and I working on the Vegas Strip, I as a Executive Chef and my husband as a dealer, we never saw each other. The commute was almost an hour and with different schedules, it was impossible to get much time to relax. We love the life, just wanted to see each other more, so when we saw that they were building closer to the Strip we decided we wanted to move there. Trouble was, my credit was below 700 and so getting a loan with a good interest was going to be impossible. What benefits did you receive by raising your credit score above 700? There were both of major benefits and minor benefits. The major one was that we were able to finally find the perfect house right off the Vegas strip with a great interest rate, allowing both myself and my husband to spend less time commuting and more time together. In addition I started to get a better interest rate on my credit cards, and I even was finally able to get a travel rewards card. A small benefit was my score was higher than my husband’s so I got to rub that in a little. How many money do you think you saved over the last four years by increasing your credit score above 700? Oh, I have no idea about the exact amount, but I know that with my credit card interest lowered, I have saved over $3,000 in just interest over the last four years. On our house, save at least $100 a month on interest, so another $4,800? Wow, I never thought about it, but we have saved at least $7,800 in four years. I am so glad that I joined Credit Sesame and increased my credit score above 700. Jon’s story is a great reminder that improving your credit score can have a big impact on your ability to make important life purchases. But, he also saw smaller benefits, like being able to get a travel rewards card. If you haven’t checked your credit report lately (or ever), request a copy from one of the three credit bureaus (Experian, Equifax, and TransUnion). By law, each bureau is required to provide you with a copy of your credit report once a year at no charge, at your request. Check your credit report for any inaccuracies or outdated information — if you find anything, immediately file a dispute with the bureau and the creditor. Source: Survey of 500 members and non-members who check their credit reports yearly. Survey was done in October annually. Consistently making your payments on time is the single best way to improve your credit score. If you slip up, though, don’t worry — while you’ll likely still have to pay a late fee, payments that are a few days late will rarely make their way onto your credit report. Anything at or beyond 30 days, however, almost definitely will. If you’re having trouble making your payments, contact your creditor to discuss your options. You may be able to work out a payment plan that won’t negatively impact your score. Your credit utilization is the next biggest piece of your credit score puzzle. The best way to reduce your credit utilization ratio is to lower your debt, thereby also lowering your utilization ratio. But sometimes, this simply isn’t possible — at least not in the immediate future. Fortunately, there’s another way you can go about improving this number. Talk with your creditors to see if they’re willing to increase your credit limit. Your debt will stay the same, but your total credit available to you will increase — and you’ll likely see a quick improvement on your score. There are so many benefits to improving your score to 700. As we mentioned, you’ll get better interest rates on loans, higher credit card limits with lower APRs, and access to more (and better) financing options. Better credit scores can save you thousands of dollars in the long run, because you’ll pay less money in interest. A good credit score can also be a tie breaker when it comes to landing an apartment or a job. Your credit score takes into account a number of different factors and is used by lenders and other financial institutions to help gauge your creditworthiness as a borrower. 700 is typically considered the “gateway” to good credit. Remember, no matter where you’re starting from, the strategies outlined above can be utilized to open up many new doors for you when it comes to your finances — saving you a significant amount of money in the process.